replacement; picking the right person is imperative. our clients use us time and time again. guarantee on every candidate we place. But sourcing out the very best, requires the best. Let us take all of the hard work off you, saving valuable time and stress in the process. We tailor our recruitment process to suit your individual requirements by getting to know your business. And the best part of all; we never forget about you – so whenever you need to find another addition to your team you can count on us to know exactly what you are looking for. Our services are completely unrivalled, with our collected first-hand experience and drive to help you succeed; you can count on us to provide only the best for your business. That’s why we offer our unique, unrivalled guarantee on every candidate we place – if for any reason our placements fail to help grow your business or they leave, we’ll replace that person FREE of charge – this service is unmatched in the UK today. You see, we believe in ourselves and we want you to as well – after all, you’ll be trusting us with a key part of your business. The key to recruitment is finding the right person and by using us and finding the right candidate from the start, you’ll save yourself a lot of money – instead of finding the wrong person and constantly running recruitment campaigns. We usually find it’s best to begin with a conversation. We’ll take the time to understand where your business is at and what you need; and if we’re a good fit for each other we can go forward from there. 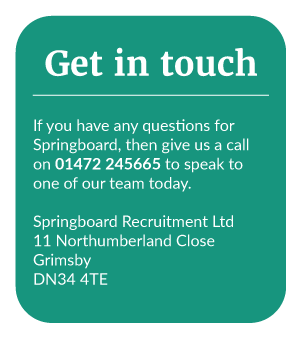 To book a call, just give us a call on 01472 245665 or email us at stuart@springboardrecruit.co.uk. Stuart provided excellent candidates to us for sales roles at BT – he is very professional, clearly understands your needs and provides quality, well briefed candidates in an organised and timely manner. He is very personable and takes a real pride in his work and company reputation. I would not hesitate to recommend him.